Size: SML Color: Assorted BrightAssorted CalmRed/Red/GreyRed/GreyBlackBlack/Grey This item is currently out of stock! Made when ordered here in our factory in Portland, Oregon, and winner of the Guides Choice Award, the 3030 Worksack fills the need of climbers for a backpack that's a a big daypack or a small overnight bag. The 3030 excels at 48 hour daytrips and overnight hikes into a climb. Born from the needs of the Cilogear Nation, the 3030 is a 40ish liter capacity pack with the suspension of the 30L hence the ridiculous name. This makes it the perfect overnight backpack: after carrying in an overnight load, the 3030 strips down to a super light summit pack that climbs really well. The 3030 is the perfect daypack when weight is a concern and you need to haul more gear than fits into a 30L. If you're a too bit too massive and burly to stuff your belay parka into a 30L, or you need just a bit more space to achieve your objective, the 3030 is the size for you. A single drawcord extension and the proven suspension system of the 30L Worksack, the 3030 is extremely light, in fact you could say that the weight is the weight of success! The 3030 includes all the hallmark Cilogear features: Ninja Pocket, internal compression strap, removable bivy pad, lid, sternum strap and hipbelt. 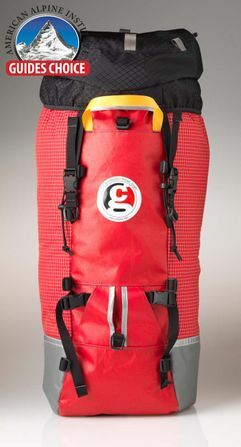 The pack comes with a set of 10 removable straps to make the system work just right for you! The 3030 does NOT come with a Framesheet. It is compatible with our new AirBeam Framesheet and our standard Framesheet. Read a review over on kurthicks.com!